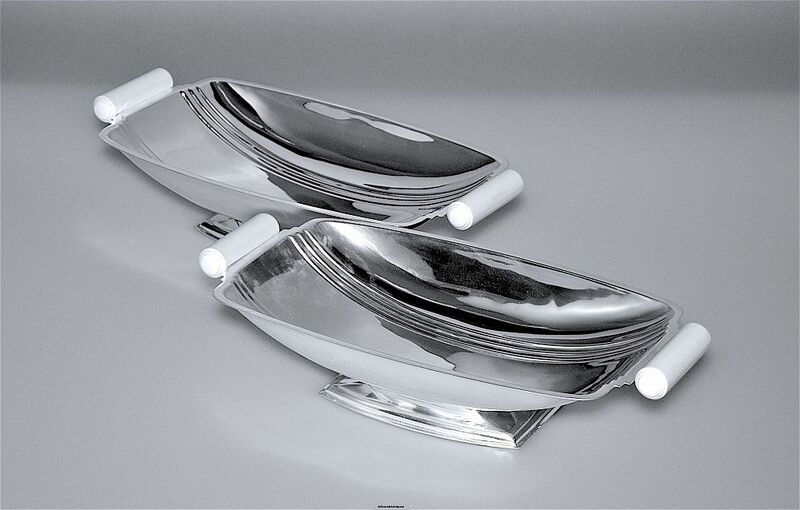 We like to buy Walker & Hall Art Deco pieces when we can find them as they are usually very stylish and well made - as with this pair of dishes. Each dish is silver plated and has a rectangular base with a small pedestal beneath a shallow boat shaped internally ridged top. The handles are white composite cylinders with ridged ends. The base of each dish has the Walker & Hall mark of the flag on a pole with "W & H" within the flag and "Walker & Hall Sheffield Ltd" & "A1" and a date letter "S" for 1946. They are offered and priced as a pair but can be sold separately in which case please contact us for an individual price.